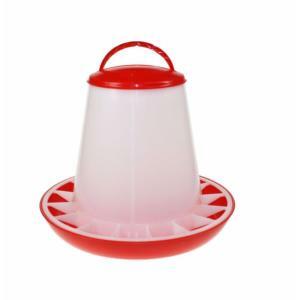 This little 1kg feeder is an ideal starter feeder for rearing a few chicks. When placed on the floor it is low enough for the chicks to feed easily, it can be hung at various heights to allow the chicks to feed as they grow therefore keeping the water clean. The feeder twists and locks so it's easy to clean. When teamed with the red and white 1ltr Drinker they're ideal to raise a few chicks. Please ensure that the feeder are suitable for the amount of chicks you have. Further information can be found in "What should I feed my chickens?"